ZAKY, M. , SHABAN, S. , FETOUH, T.
This paper proposes an adaptive and robust sliding mode control (SMC) for the position control of Interior Permanent Magnet Synchronous Motor (IPMSM) drives. A switching surface of SMC is designed using a Linear Quadratic Regulator (LQR) technique to simultaneously control the tracking trajectory and load torque changes. The quadratic optimal control method is used to select the state feedback control gain that constitutes the system dynamic performance under uncertainties and disturbances. Feedback and switching gains are selected to satisfy both stability and fast convergence of the IPMSM. Matlab/Simulink is used to build the drive system. Experimental implementation of the IPMSM drive is carried out using DSP-DS1102 control board. The efficacy of the proposed position control method is validated using theoretical analysis and simulation and experimental results. 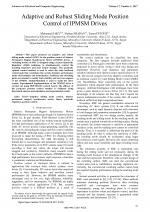 Two-Degrees of Freedom and Variable Structure Controllers for Induction Motor Drives, ZAKY, M., TOUTI, E., AZAZI, H., Advances in Electrical and Computer Engineering, ISSN 1582-7445, Issue 1, Volume 18, 2018. Website conception, design and maintenance by Eugen COCA. Content updated on 28 Feb 2019. Site engine updated on 28 Feb 2019. This page was generated on the server in 0.047 seconds and loaded in your browser in > seconds.